ProjectSheet is a Google spreadsheet with Add-on functionality which you can get and manage from a Google spreadsheet Add-ons menu. The add-on creates two sheets for Task schedule and Resources and a sidebar on the right side of the sheets with project scheduling functions. The sheets can be selected from tabs at the bottom of the spreadsheet. You can edit the sheets with the standard spreadsheet functions in combination with the special add-on functions from the sidebar. You can close the sidebar by clicking on X at the right top. Re-opening the sidebar is done using menu Add-ons > ProjectSheet > Open sidebar. You can provide all empty or copied Google spreadsheets with ProjectSheet from menu Add-ons > ProjectSheet > Add ProjectSheet. In case of an empty spreadsheet wait until the sheets are completed and the sidebar appears. ProjectSheet columns are the Task columns and Resource columns (Pro). Custom columns and worksheets you add yourself. ProjectSheet renumbers the WBS when you move, remove, erase or copy tasks. As soon as you start using ProjectSheet for the first time, Google gives an authorization screen. Here you can see that the add-on modifies the spreadsheet and that it requires access to an external service because of the Pro functionality. If you do not want ProjectSheet anymore in a certain spreadsheet, you can disable it at menu Add-ons > Manage add-ons.... It opens a dialog with all your add-ons. Select MANAGE at ProjectSheet and un-select 'Use in this document'. After you did this you can delete the tabs without rebuild. In the same menu you can 'Remove' ProjectSheet completely from all your spreadsheets. The task sheet consists of a table on the left and an accompanying Gantt chart on the right. Each column in the table has a header indicating the type of information in its column. The header titles can be customized to for instance a different language. The order of the present columns can be changed and custom columns can be inserted. A row represents a task as soon as it is described in column 'Task description'. Removing the description will remove the task and make the row empty. Rows may remain empty for readability. Use normal spreadsheet functions to insert, clear, delete or copy rows. A task is a summary task as a result of the Work Breakdown Structure (WBS). A summary task has subtasks and only requires a Task description. Start date, Finish date, Progress, Work and Cost are calculated as a result from its subtasks. Summary tasks have their row text in bold. A milestone indicates an important moment in the schedule. It is a task that only has a finish date, the start date is left empty. In the Gantt chart a milestone is visible with a different color than normal tasks and summary tasks. In the Pro version a milestone has a duration of 0 days. The Gantt chart is positioned right from the task table in the task sheet. The Gantt chart shows a time frame with a timescale. This section can be shifted and zoomed. The Gantt chart shows each task with a horizontal bar from its start date to its finish date inside the timescale. Summary task, normal task and milestone bars have different default colors. The color of a task bar follows the background color of the Task description cell if Gantt bar with progress color is disabled and a background color other than white is selected. If today's date falls in the timescale, a vertical dashed line indicates this date. The progress percentage of a task is translated into a double line in the task bar in the Gantt chart. If this double line stops before the current date indication, this means project delay. The task columns are in the Task sheet. This column is read-only and states the WBS (Work Breakdown Structure) code per task. Changes in the WBS (like inserting tasks) may result in renumbering of WBS codes. Changing a task's level of indent is done by WBS functions in the sidebar. The code consists of steps divided by dots. Step numbers consist of consecutive numbers starting at 1. The amount of steps equals the level of the WBS code. Codes having an equal start belong together. Tasks B, C and F have the same level. They each have two steps. Tasks D and E belong to the same summary task C, they share the same first two steps. The WBS column is read-only. The WBS code of all tasks are re-calculated automatically after each affecting change. The task description is the starting point of the schedule. The description states what needs to be done or what needs to be delivered. The text will indent according to its WBS level. Notes can be added to a Task description by using the right mouse click menu. Newly added tasks will automatically get a WBS code with the same outline level as the previous task. A task and its WBS code will disappear entirely if its description is deleted. These columns contain the start date and finish date of each task. These dates are shown as a bar in the Gantt chart if they are inside the time scale. Summary tasks receive their dates from their subtasks, they cannot be entered. 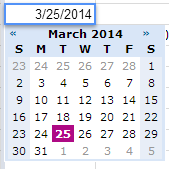 Double-clicking an entered date gives a calendar pop-up to adjust the date. The progress of each task is entered in %. Summary tasks calculate the progress of their subtasks, there is no need to enter them. The task duration is entered in working days. Two weekend days are taken into account and are not counted in the duration and proceed the week start day as selected in the sidebar. The finish date follows a change in the duration. The duration follows a change in the finish date. Work hours follow duration days with 8 hours per day if they are coupled with this option in the sidebar. Removing the duration removes the start and finish dates. Summary task days cannot be entered, they are calculated based on their start and finish dates. A duration of 0 gives a milestone. Enter here the hours for a task. A summary task adds the hours of the underlying subtasks. In the sidebar there is an option to link Work hours to Days task duration, under Adjust working time. If unchecked, the work hours needs to be updated manually. If checked, changing one will also update the other. When assigning work resources, the Work hours will not change, the Days duration follows the Work hours and availability. The duration is equal to the Work hours divided by the hours per work day as set in the sidebar under 'Adjust working time' (default 8 hours). Assigning multiple work resources to the same task will keep Work hours the same and shorten the Days duration. A resource is automatically added to the Resources sheet or adjusted if already present. The cost per task, calculated from the assigned resource quantities and the cost per resource, and in case of a work resource, the required work hours. The work hours per task are divided amongst the assigned work resources based on availability. A summary task aggregates costs of its underlying subtasks. Costs of the summary task itself are also added. A user defined column can contain any information. Also cell formulas can be applied for dedicated calculations. The resource columns are in the Resource sheet. Descriptive name of the resource. A resource will disappear entirely if its name is deleted. A resource can be a work resource (default) or a material resource. Work resources are counted per work hour, material resources are counted per unit. Cost for a resource per hour or unit. All work hours or units assigned to a single resource across all tasks. All cost of a single resource across all tasks. In the Holidays worksheet dates can be noted that cause delaying the project schedule. Each row contains the date for one day. The date applies to all resources at once. Press Refresh in the sidebar to skip the holidays in the schedule. 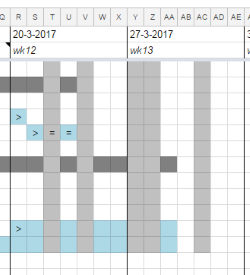 The non-working dates are shown in the Gantt chart as vertical grey bars. The bars will only be shown when the Gantt scale is 1 week / period which corresponds to 1 day / cell. Non-working dates which fall outside the workweek are not shown (weekends). With other scales the holidays are not shown in the Gantt chart, but they are taken into account for the schedule. Some functions require that one or more tasks are selected first before choosing a function in the sidebar. Selection can be done per row at the left margin of the sheet or by selecting any cell in the task row. Only adjacent rows can be selected, not multiple selections. The sidebar can be closed with X in its black title bar. The sidebar can be opened again in the add-ons menu of the spreadsheet. This function decreases / increases the level of the WBS code and the amount of indent of the task descriptions of the selected tasks. For example WBS 1.2.2 becomes 1.3 or WBS 1.3 and 1.4 become 1.2.1 and 1.2.2. 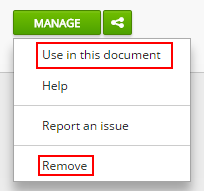 All subtasks of the selected summary task(s) are hidden / shown. Selecting multiple summary tasks can only be done by selecting adjacent rows in which they fall, not by using multiple selections. Only summary tasks are shown / all hidden tasks are shown again. Hide all completed tasks. Show them again with 'show all tasks'. Shift non-summary tasks in time, adjusting their start and finish dates. Select adjacent task(s) you like to shift. Selected summary tasks cannot not be shifted themselves, but will follow their shifted subtasks. Choose Get in the Sidebar to show the earliest start date of the selected task(s). Enter the new earliest start date in the calendar. Press Set to shift the selected task(s) accordingly. In order to see the shifted tasks in the Gantt chart, it may be needed to change the start date of the time scale. In the Pro version chaining comes before shifting, and shifting always results in a working day. The start date will be the first start day of the work week before the resulting date. The time scale consists of 10 periods. A period can last from 1 to 13 weeks. Each period starts at the chosen start day of the work week, which date and week number are indicated. A period has 7 scale units. See the table below for the corresponding total scale time. The first day of the work week can be set to Sunday or Monday. The start day of a period in the Gantt timescale will be adjusted. In the Pro version the weekend calculation will be done in line with this setting (Friday-Saturday or Saturday-Sunday). Monday is the default setting. When selected, the background color of the Progress cell indicates progress status. When selected, the Gantt bar color indicates progress status. A new tab will open with this page. Start a 10-days trial with the Pro features or activate this version after your PayPal purchase. In the black title bar Pro will appear after ProjectSheet and in case of the trial between brackets the remaining number of days. This function in the Sidebar assigns resources to the selected task(s). Select adjacent task(s) in 'Task schedule' sheet. Choose required resource in pull-down or add a new resource. Enter the required Quantity or leave empty for 1. Press Assign button or Remove button. It is possible to set the work hours of a task as a total or per resource. Dividing the work hours over the resources is desirable if the resources do the same work. More resources means that the work hours are divided over the resources depending on the allocation, which is enclosed in brackets after the resource. If the resources allocated to a task do different work, it is desirable to allocate the work hours to each resource individually. With the assignment, which is enclosed in brackets after the resource, it is then possible to vary the hours allocated to a task per resource. Set the start day of the work week, the number of working days per week and the number of working hours per work day. Task duration and Work hours can be set independent or follow each other with the set working hours per day. The option takes effect on changes and on new tasks only. This function in the Sidebar recalculates the WBS codes and the Gantt chart. In some cases they are not automatically updated after changes.